Our group of five authors planned and plotted to do a Valentine's Day anthology, but needed something to bring all the stories together. A common thread that will weave each novella and bring them into a theme surrounding Valentine's Day is an easy thing. Coming up with something not done before...not so easy. The "what if?" came with the conception of my muse, the hero for my story. As I toyed with the idea of a Highlander named Valent, archer, of course (queue the cupid reference) the muse said. "Why can't I be the common thread? Put me in each of the author's hands and I will play whatever role they put me in." What a smart guy that Valentino. Hence, I take full credit because he can't since technically he is imaginary. I hope that you can catch glimpses of the same character in each story as he is thrown into different arenas to conquer our reader's minds and hearts. Ladies and gentlemen, I present to you Valentino. Same Hero, Different Worlds. 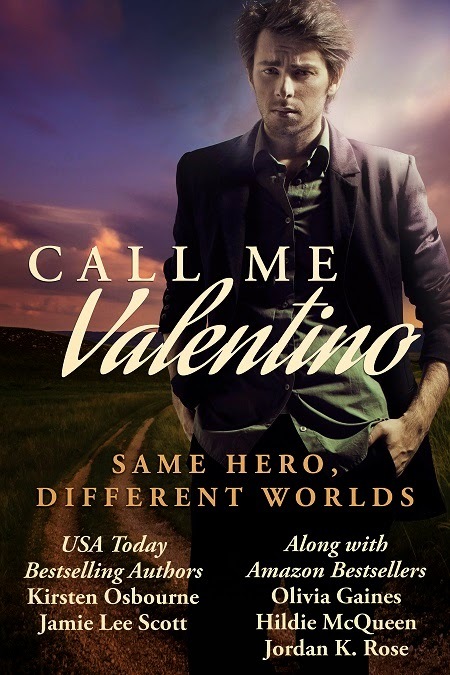 One hero, five different worlds, which Valentino will you fall in love with? Join the Valentino craze! Be sure to join the Facebook party on Feb 12! Since being widowed, Cassie Morgan had devoted her life to the orphans in the orphanage she'd managed. When a new church took over the orphanage and decided to turn it into a boys' home, she was both frightened and unsure about how she would make things work for the girls. Being told she had to take fifteen young ladies all the way to Texas from New York didn't make her feel better. Valentino Hayes had spent his entire adult life searching for the younger brother he vaguely remembered. Just after finding a lead that would send him to Fort Worth, he was offered the job of driving a bus full of orphans to Texas. He jumped at the chance, knowing he needed to not only find his brother, but work while he was searching. He didn't plan on Mrs. Morgan's love for the children to turn his head. Could he convince her to travel with him? And how was he going to provide for a wife while he was still searching for his brother? Undercovers by Jamie Lee Scott When FBI agent Valentino "Vin" Jackson's undercover sting operation goes bad, he teams up with Special Agent Ellis Boyd of the DEA, who has some special talents of her own, to take down a drug ring working for the Mexican cartels. The Brute and the Blogger by Olivia Gaines Tino Boehner was up to his ears with Ebony Miller’s pot shots at him on her blog. Just as he was trying to figure out how to turn the tables, fate dumped her in his lap. Seizing the opportunity, he made her an offer she couldn’t refuse; come work by his side for a month. A month can be a lifetime, or just enough time to make a man want to change his brutish ways. Highlander, The Archer by Hildie McQueen Valent made an oath to protect the McLeod clan after they rescued him as a foundling. However, after years of mistreatments at the Lairds hands, he questions his obligation to uphold his promise. When a rival clan attacks and kills her brothers, Ariana McLeod's world is turned upside down. That she's fallen in love with the handsome archer, Valent, is a complication and a blessing at once. Amidst battles, revelations and treachery, is it possible to expect their love to triumph? A Vampire's Penance by Jordan K. Rose The chain of events set in motion when Rafe Valentino tries to stop his brother from making the stupidest decision of his life borders on deadly. Rafe goes from being one of the most terrifying creatures to walk the earth to requiring around the clock nursing care. As if being physically injured wasn’t enough, the senior member of The Vampire Guard has no choice but to reveal the heinous secret of his past in order to protect nurse Maddie Van Kool from throwing away her life on him. 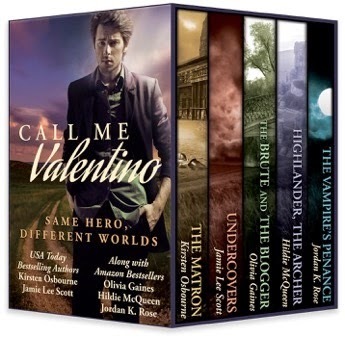 I love anthologies and this one sounds so good! I don't think I've come across something like this before, where it's the same hero re-imagined in different stories by different authors. Love this idea!